SOME GENERAL OBSERVATIONS ABOUT PAPER-MAKING MATERIALS—PROBABILITIES AS TO THE FUTURE OF THE PUBLIC RECORDS—ESTIMATION OF SUCH MATTERS BY THE LATE POPE—INVENTION OF WOOD-PULP PAPER ITS LASTING QUALITIES—THE THREE KINDS OF SUCH PAPER DEFINED—DISCUSSION OF THE SUBJECT OF FUNGI IN PAPER BY GLYDE—SOME TESTS TO ASCERTAIN THE MATERIAL OF WHICH PAPER IS COMPOSED—TESTS AS TO SIZING AND THE DETERMINATION OF THE DIRECTION OF THE GRAIN—ABSORBING POWERS OF BLOTTING PAPER—TESTS FOR GROUND WOOD—NEW MODE OF ANALYSTS—WHEN THE FIRST “SAFETY” PAPER WAS INVENTED—THE MANY KINDS OF “SAFETY” PAPER AND PROCESSES IN THEIR MANUFACTURE—CHRONOLOGICAL REVIEW COVERING THIS SUBJECT—SURVEY OF THE VARIOUS PROCESSES IN THE TREATMENT AND USE OF “SAFETY” PAPER—ONLY THREE CHEMICAL “SAFETY” PAPERS NOW ON THE MARKET—WHY IT IS POSSIBLE TO RAISE SOME MONETARY INSTRUMENTS. PAPER manufacturers have tried all the pulp-making substances. This statement to the unlearned must seem curious, because in the very early times they were content with a single material and that did not even require to be first made into the form of pulp. When the supply of papyrus failed, it was rags which they substituted. By the simplest processes they produced a paper with which our best cannot compare. In some countries great care is exercised in selecting the quality of paper for official use, in others none at all. What will be the state of our archives a few hundred years hence, if they be not continually recopied? Some of the printed paper rots even more quickly than written. The late Pope at one time invited many of the savants, chemists and librarians of Europe, to meet at Einsiedlen Abbey in Switzerland. He requested that the subject of their discussions should be both ink and paper. He volunteered the information, already known to the initiated, that the records of this generation in his custody and under his control were fast disappearing and unless the writing materials were much improved he estimated that they would entirely disappear. It is stated that at this meeting the Pope’s representative submitted a number of documents from the Vatican archives which are scarcely decipherable though dated in the nineteenth century. In a few of those of dates later than 1873 the paper was so tender that unless handled with exceptional care, it would break in pieces like scorched paper. These conditions are in line with many of those which prevail with few exceptions in every country, town or hamlet. A contributory cause as we know is a class of poor and cheap inks now in almost universal use. The other is the so-called “modern” or wood-pulp paper in general vogue. Reaumur, as already stated, back in 1719 suggested from information gathered in examinations of wasps’ nests, that a paper might be manufactured from wood. This idea does not appear to have been acted upon until many years later, although in the interim inventors were exhausting their ingenuity in the selection of fibrous materials from which paper might be manufactured. The successful introduction of wood as a substitute for or with rags in paper manufacture until about 1870 was of slow growth; since which time vast quantities have been employed. In this country alone millions of tons of raw material are being imported to say nothing of home products. Its value in the cause of progress of some arts which contribute greatly to our comfort and civilization cannot be overestimated, but nevertheless the wood paper is bound to disintegrate and decay, and the time not very far distant either. Hence, its use for records of any kind is always to be condemned. The soda process wood and sulphite wood pulp are both made by chemical processes. The first was invented by Meliner in 1865. The preparation of pulp by this process consists briefly in first cutting up the logs into suitable sections and throwing them into a chipping machine. The chips are then introduced into tanks containing a strong solution of caustic soda and boiled under pressure. The sulphite process is substantially the same except that the chips are thrown into what are called digesters and fed with the chemicals which form an acid sulphite. The real inventor of this latter process is not known. The chemicals employed in both of these processes compel a separation of the resinous matters from the cell tissues or cellulose. These products are then treated in the manufacturing of paper with few variations, the same as the ordinary rag pulp. These now perfected processes are the results of long and continuing experimentations made by many inventors. “Owing to the imperfections formerly existing in the microscope, little was known of the real nature of the plants called fungi until within the last few years, but since the improvements in that instrument the subject of the development, growth, and offices of the fungi has received much attention. They compose, with the algae and lichens, the class of thallogens (Lindley), the algae existing in water, the other two in air only. A fungus is a cellular flowerless plant, fructifying solely by spores, by which it is propagated, and the methods of attachment of which are singularly various and beautiful. The fungi differs from the lichens and algae in deriving their nourishment from the substances on which they grow, instead of from the media in which they live. They contain a larger quantity of nitrogen in their constitution than vegetables generally do, and the substance called ‘fungine’ has a near resemblance to animal matter. Their spores are inconceivably numerous and minute, and are diffused very widely, developing themselves wherever they find organic matter in a fit state. The principal conditions required for their growth are moisture, heat, and the presence of oxygen and electricity. No decomposition or development of fungi takes place in dry organic matter, a fact illustrated by the high state of preservation in which timber has been found after the lapse of centuries, as well as by the condition of mummy-cases, bandages, etc., kept dry in the hot climate of Egypt. Decay will not take place in a temperature below that of the freezing point of water, nor without oxygen, by excluding which, is contained in the air, meat and vegetables may be kept fresh and sweet for many years. There are numerous paper tests which include the matter of sizing, direction of the grain, absorbing powers, character of ingredients, etc. A few of them are cited. SIZING.—The everyday tests as to hardness of sizing answer every ordinary purpose: Moisten with the tongue, and if the paper is slack-sized you can detect it often by the instant drawing or absorption of the moisture. Watch the spot moistened, and the longer it remains wet the better the paper is sized. Look through the spot dampened—the poorer the sizing the more transparent is the paper where it is wet. If thoroughly sized no difference will be apparent between the spot dampened and the balance of the sheet. When there is a question as to whether a paper is tub or engine sized, it can be usually decided by wetting the forefinger and thumb and pressing the sheet between them. If tub-sized, the glue which is applied to the surface will perceptibly cling to the fingers. Draw a heavy ink line across the sheet. If the paper is poorly sized, a feathery edge will appear, caused by spreading of the ink. Slack-sized paper will be penetrated by the ink, which will plainly appear on the reverse side of the sheet. For instance, the size of sheet is 17x22 inches. Cut out a circular piece as nearly round as the eye can judge; before entirely detaching from the sheet, mark on the circle the 17-inch way and the 22-inch way; then float the cut out piece on water for a few seconds; then place on the palm of the hand, taking care not to let the edges stick to the hand, and the paper will curl until it forms a cone; the grain of the paper runs the opposite way from which the paper curls. ABSORBING POWERS OF BLOTTING PAPER.—Comparative tests as to absorbing powers of blotting can be made between sheets of same weight per ream by allowing the pointed corner of a sheet to touch the surface of a drop of ink. Repeat with each sheet to be tested, and compare the height in each to which the ink has been absorbed. A well-made blotting paper should have little or no free fibre dust to fill with ink and smear the paper. TEST FOR GROUND WOOD.—Make a streak across the paper with a solution of aniline sulphate or with concentrated nitric acid; the first will turn ground wood yellow, the second will turn it brown. I give aniline sulphate the preference, as nitric acid acts upon unbleached sulphite, if present in the paper, the same as it acts upon ground wood, viz., turning it brown. Phloroglucin gives a rose-red stain on paper containing (sulphite) wood pulp, after the specimen has been previously treated with a weak solution of hydrochloric acid. 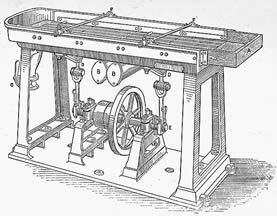 About the end of the eighteenth century it became necessary to make special papers denominated “safety paper.” Their manufacture has continued until the present day although much limited, largely because of the employment of mechanical devices which seek to safety monetary instruments. Such safety papers are of several kinds. 1. Paper made with distinguishing marks to indicate proprietorship, as with the Bank of England water mark, to imitate which is a felony. Or the paper of the United States currency, which has silk fibers united with the pulp, the imitation of which is a felony. 2. Paper made with layers or materials which are disturbed by erasure or chemical discharge of written or printed contents, so as to prevent fraudulent tampering. 3. Paper made of peculiar materials or color, to prevent copying by photographic means. One kind is made of a pulp tinged with a stain easily affected by chlorine, acids, or alkalis, and is made into sheets as usual. Water marks made by wires twined among the meshes of the wire cloth on which the paper is made. Threads embodied in the web of the paper. Colored threads systematically arranged were formerly used in England for post-office envelopes and exchequer bills. Silken fibers mixed with the pulp or dusted upon it in process of formation, as used in the United States currency. Tigere, 1817, treated the pulp of the paper, previous to sizing, with a solution of prussiate of potash. Sir Win. Congreve, 1819, prepared a colored layer of pulp in combination with white layers, also by printing upon one sheet and covering it with an outer layer, either plain or water-marked. Glynn and Appel, 1821, mixed a copper salt in the pulp and afterward added an alkali or alkaline salt to produce a copious precipitate. The pulp was then washed and made into paper and thereafter dipped in a saponaceous compound. Stevenson, 1837, incorporated into paper a metallic base such as manganese, and a neutral compound like prussiate of potash, to protect writing from being tampered with. Varnham, 1845, invented a paper consisting of a white sheet or surface on one or both sides of a colored sheet. Stones, 1851. An iodide or bromide in connection with ferrocyanide of potassium and starch combined with the pulp. Johnson, 1853, employed the rough and irregular surface produced by the fracture of cast iron or other brittle metal to form a water mark for paper by taking an impression therefrom on soft metal, gutta-percha, etc., and afterward transferring it to the wire cloth on which the paper is made. Scoutteten, 1853, treated paper with caoutchoue dissolved in bisulphide of carbon, in order to render it impermeable and to prevent erasures or chemical action. Ross, 1854, invented water-lining or printing the denomination of the note in colors while the pulp was yet soft. Evans, 1854, commingled a lace or open-work fabric in the pulp. Courboulay, 1856, mixed the pulp and applied to the paper salts of iodine or bromine. Loubatieres, 1857, manufactured paper in layers, any or all of which might be colored, or have impressions or conspicuous marks for preventing forgery. Herapath, 1858, saturated paper during or after its manufacture with a solution of a ferrocyanide, a ferriccyanide, or sulphocyanide of potassium, sodium, or ammonium. Seys and Brewer, 1858, applied aqueous solutions of ferrocyanide of potassium or other salts, which formed an indelible compound with the ferruginous base of writing ink. Sparre, 1859, utilized opaque matter, such as prussian blue, white or red lead, insoluble in water and stenciled on one layer of the paper web, forming a regular pattern; this was then covered by a second layer of paper. Moss, 1859, invented a coloring matter prepared from burned china or other clay, oxide of chromium or sulphur, and combined it with the pulp. 1. Soluble ferrocyanides, ferricyanides, and sulphocyanides of various metals, by forming dibasic salts with potassium, sodium, or ammonium, in conjunction with vegetable, animal, or metallic coloring matters. 2. Salts of manganese, lead, or nickel not containing ferrocyanogen. 3. Ferrocyanides, etc., of potassium, sodium, and ammonium, in conjunction with insoluble salts of manganese, lead, or nickel. Hooper, 1860. Employed oxides of iron, either alone or dissolved in an acid, and mixed with the pulp. Nissen, 1860. Treated paper with a preparation of iron, together with ammonia, prussiate of potash and chlorine, while in the pulp or being sized. Middleton, 1860. Joined together one portion of a bank note printed upon one sheet of thin paper and the other part on another; the two were then cemented together by india-rubber, gutta-percha, or other compound. The interior printing could be seen through its covering sheet, so that the whole device on the note appeared on its face. Olier, 1861. Employed several layers of paper of various materials and colors; the middle one was colored with a deleble dye, whose color was changed by the application of chemicals to the outer layer. Olier, 1863. Prepared a paper of three layers of different thicknesses, the central one having an easily removable color, and the external layers were charged with silicate of magnesia or other salt. Forster and Draper, 1864. Treating paper during or after manufacture with artificial ultramarine and Prussian blue or other metallic compound. Hayward, 1864. Incorporated threads of fibrous materials of different colors or characters into and among the pulp. Loewenberg, 1866. Introduced prussiate of potash and oxalic acid or such other alkaline salts or acids into the pulp, in order to indicate fraud in the removal of cancellation stamps or written marks. Casilear, 1868. Printed numbers on a fugitive ground, tint or color in order to prevent alteration of figures or numbers. Jameson, 1870. Printed on paper, designs with ferrocyanide of potassium and then soaked the paper when dry in a solution of oxalic acid in alcohol. Duthie, 1872. Made a ground work of writing ink of different colors by any known means of pen ruling. Syms, 1876. Produced graduated colored stains, which were made to partially penetrate and spread in the pulp web. Van Nuys, 1878. Colored the Paper with a pigment and then printed designs with a soluble sulphide. Casilear, 1878. United two distinctive colored papers, one a fugitive and the other a permanent color. Hendrichs, 1879. Dipped ordinary paper in an aqueous solution of sulphate of copper and carbonate of ammonia and then added alkaline solutions of cochineal or equivalent coloring matter. Nowlan, 1884. Backed the ordinary chemical paper with a thin sheet of waterproof paper. Menzies, 1884. Introduced iodide and iodate of potassium or their equivalents into paper. Clapp, 1884. Saturated paper with gallo-tanic acid, but the ink used on this paper contained ferri-sesquichloride or other similar preparation of iron. Hill, 1885. Introduced into paper, ferrocyanide of manganese and hydrated peroxide of iron. Schreiber, 1885. Colored paper material with indigo and with a subsequent treatment of chromates soluble only in alcohol. Schreiber, 1885. Treated finished paper with ferric-oxide salts and with ferrocyanides insoluble in water but soluble in acids. Schlumberger, 1890. Impregnated white paper with a resinated ferrous salt, a resin compound of plumbic ferrocyanide, and a resin compound of ferrocyanide of manganese in combination with a salt of molybdenum and a resin compound of zinc sulphide. Schlumberger, 1893. Dyed first the splash fibers and mixed them with the paper pulp. Second. He also treated portions of the surface with an alkali, so as to form lines or characters thereon, then immersed the same in a weak acid, in order to produce water-mark lines. Carvalho, 1894. 1. Charged the paper with bismuth iodide and sodium iodide. 2. Charged the paper with a bismuth salt and iodide of soda in combination with primulin, congo red or other pigment. 3. Charged the paper with a benzidine dye and an alkaline iodide. 1895. Applied a compound, sensitive to ink erasing chemicals, AFTER the writing has been placed on the paper. Hoskins and Weis, 1895, a safety paper having added thereto a soluble ferrocyanide and a per-salt of iron insoluble in water but decomposable by a weak acid in the presence of a soluble ferrocyanide, as and for the purpose described. (2) A safety paper having added thereto a ferrocyanide soluble in water, a per-salt of iron insoluble in water but easily decomposed by weak acids in the presence of a ferrocyanide soluble in water, and a salt of manganese easily decomposed by alkalis or bleaching agents, substantially as described. A review of the various processes for treatment of paper in pulp or when finished, demonstrates that time, money and study has been devoted to the production of a REAL safety paper. Some compositions and processes have in a measure been successful. It is found, however, that the ingenuity of those evil-minded persons, to the detection of whose efforts to alter the writing in documents this class of invention has more particularly been directed, finds a ready way of removing in some cases the evidence which the chemical reagent furnishes. This being true most of them have become obsolete, having entirely failed to accomplish the purposes for which they were invented. There are but three so-called safety papers now on the market, if we exclude those possessing printed designs in fugitive colors. It is a strange anomaly, nevertheless it is true, that 90 per cent or more of the “raised” checks, notes, or other monetary instruments which were in their original condition written on ordinary or so-called safety paper, never could have been successfully “put through” but for the gross and at times criminal negligence of their writers by the failure to adopt precautions of the very simplest kinds, and thereby avoided placing temptation in the way of many who under other circumstances would never have thought of becoming forgers. There is no safety paper, safety ink, or mechanical appliance which will prevent the insertion of words or figures before other words or figures if a blank space be left where the forger can place them.